Chamber Music at the Clark concert seating is determined via lottery. The booking-by-lottery entry form for Henschel Quartett with Lynn Harrell, Cellist concert seats posts here on Thursday, January 11, 2018. Lottery registration closes Thursday, February 1, 2018. The Henschel Quartett’s musical journey has included many remarkable highlights, including playing at the official re-opening of the Duchess Anna Amalia Library in Weimar (a UNESCO World Heritage site), travel to Brussels as a Cultural Ambassador of the Federal Republic of Germany, and in 2010 a performance at the Vatican in the presence of Pope Benedict XVI. The Quartett has regularly been invited to the Royal Palace of Madrid to perform on the four Stradivari of the royal collection. 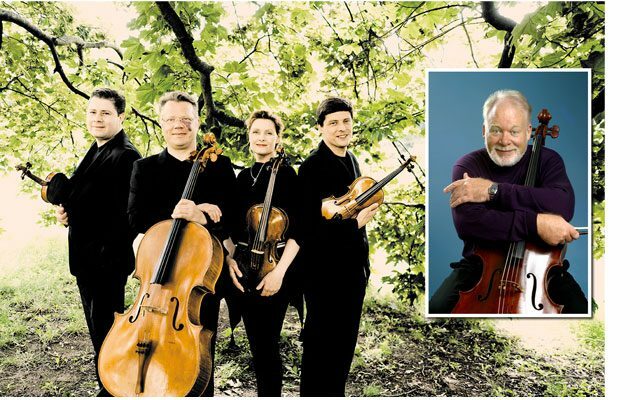 In June 2012 the Henschel Quartett was invited, as the first European quartet in twenty years, to perform Beethoven’s complete string quartets in the prestigious Suntory Hall in Tokyo. The Henschel Quartett regularly accepts invitations to teach at world-class institutions, including Yale University, the Royal Northern College of Music in England, and the University of Melbourne in Australia. The ensemble is also engaged in an ongoing dialogue with the Bavarian Ministry of Culture in relation to youth music projects in their home city of Munich. A consummate soloist, chamber musician, recitalist, conductor, and teacher, Lynn Harrell’s work throughout the Americas, Europe, and Asia has placed him in the highest echelon of today’s performing artists. In recent seasons, Mr. Harrell performed domestically with the symphonies of Atlanta, Sydney, and Detroit, and the Metropolian Opera Orchestra to close the season at Carnegie Hall. Abroad, he played alongside the Gewandhaus Orchestra Leipzig, China and Seoul Philharmonic Orchestras, Duisberg Symphony, and the Orquestra Sinfônica Brasileira. He toured North America and Europe with the Mutter-Bronfman-Harrell Trio to venues including Carnegie Hall, the Maison Symphonique de Montreal, the Salzburg Großes Festspielhaus, and Dresden’s Semperoper. An accomplished recording artist, Lynn Harrell’s discography of more than 30 recordings include the complete Bach Cello Suites (London/Decca), and two Grammy wins with Itzhak Perlman and Vladimir Ashkenazy in 1981 for the Tchaikovsky Piano Trio and in 1987 for the complete Beethoven Piano Trios (both Angel/EMI).